Amanoya Yotsugo wa Ketsuekigata ga Zenin Chigau. There's an idea that your blood type affects your personality: Type-A's are serious perfectionists, Type-B's are individualistic, Type-O's are outgoing, and Type-AB's are strange. This 4-koma features the four sisters of the Amano family, who are each very different from one another in looks, personality, and even blood type. Despite growing in the same environment, they each have a personality similar to their blood type. The oldest, Type-A Asahi, carefully dresses like a stylish girl to hide her perfectionism. The second sister, Type-B Mahiru, follows her own path. The next youngest, Type-O Yuu, is very social and gregarious. The youngest sister, Type-B Koyoru, is distant and hard to read. The four sisters go through their daily life together, each very different from the other! 10 years ago, a mushroom-shaped alien spaceship landed on Earth, but the media began to lose interest in it as time went on and nothing exciting happened. Now, a change is coming. The retired "brancher" fighter, BadLuck, kills a professor in order to protect a demon girl named Limit. However, the professor was using convicts, and BadLuck has ended up being treated as an accomplice to their escape. Now he's been arrested, and he will have to fight in a deadly tournament in order to be acquitted! Hoshi no Jouou-sama was pretty interesting, though it is a general premise I've seen before. 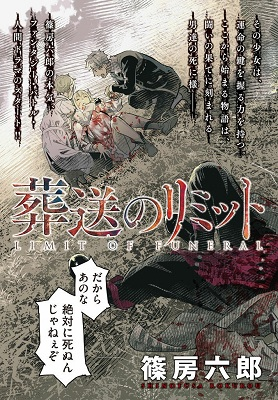 Amanoya Yotsugo wa Ketsuekigata ga Zenin Chigau would be good for anyone wanting a light 4-koma comedy, though I don't buy the blood-type-based personalities. It was hard for me to get into Sousou no Limit, but I'm sure many people will find it an exciting story. Amanoya Yotsugo wa Ketsuekigata ga Zenin Chigau. 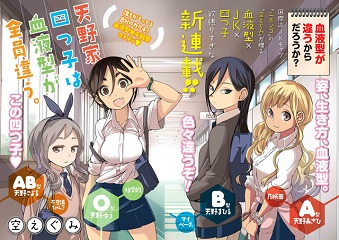 - If you're in the mood for a nice 4koma slice of life comedy, then you should take a look at this. 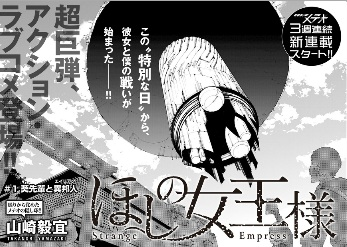 Hoshi no Joou-sama - However, if you like sci-fi mixed with some action, then this may be more what you're looking for. If you haven't done so already, check out the scanlations of the manga from previous shout outs which have been recently scanlated: sci-fi action manga Kuroa Chimera (MH link).